Sentient Developments: Anders Sandberg: Does the recent LHC breakdown prove quantum immortality? Anders Sandberg: Does the recent LHC breakdown prove quantum immortality? Before you read this post you might want to brush up on the whole quantum immortality argument. 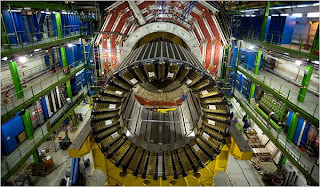 Okay, you know how the Large Hadron Collider had to be shut down because of of a helium leak? Well, what if this is evidence that we're about to witness a successive chain of events that will result in the LHC never having the opportunity to destroy the Earth as we know it? It's a classic case of anthropic principle meets the Many World Hypothesis. We can't observe our non-existence; we can only observe our ongoing existence, no matter how improbable or absurd. Given that the LHC was only recently ignited, can we already make this inference? Well, leave it to Anders Sandberg to crunch the numbers and do an analysis: "Bayes, Moravec and the LHC: Quantum Suicide, Subjective Probability and Conspiracies." And it looks like Eliezer Yudkowsky and friends are having a similar conversation at Overcoming Bias. Quick summary of their opinions: We can't jump to this conclusion. Yet. I have never heard of it referred to as quantum immortality. When I considered it myself many years ago I thought of it as the Continuity of Consciousness Hypothesis and that it was more of a statistical concept rather than quantum. I even did search on that term in google and last I had checked I could find no reference. I had thought about it because of certain accidents in my life where in all likely hood I should have been killed but instead things worked out okay. Bicycle accident, falling out of a tree, etc. The whole god and angels watching out for me just did not cut it. Of course I have not decided if it is really immortality or if you just keep replaying the same existence over and over again ad infinitum. I guess I will not know that for another 80 to 100 years at least. I was wondering when someone would notice. Hahaha! Leave it to the egghead brigade to find opportunities to do maths even when the initial chance of the maths being relevant (the chance the collider will be harmful to sentient interests on Earth) is vanishingly small. On Yudkowsky's point about only activating a doomsday supercollider in the event of a major terrorist attack or a Palin presidency the return of the Ice Capades or something; wouldn't that just regress the problem a degree? "Damn, Palin joins the Ice Capades and our f***ing supercollider keeps breaking!"